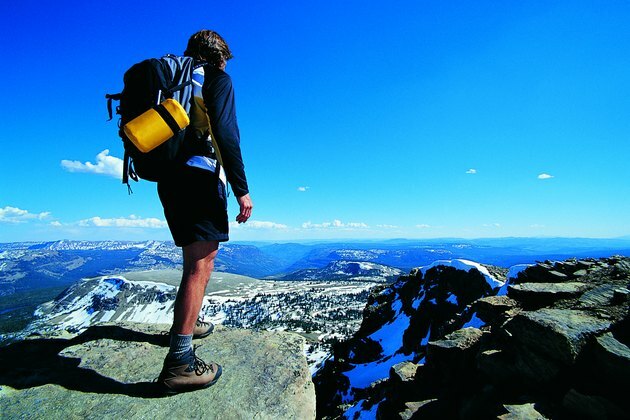 What Are the Benefits & Disadvantages of Hiking? As temperatures rise, many people retreat to mountain trails to escape the heat and enjoy time with nature. Hiking can be a challenging activity and requires a positive attitude and determined frame of mind. This form of exercise strengthens the muscles, improves heart health and boosts mood. However, hiking can become a dangerous and miserable experience if you are not prepared for conditions. Consult a doctor to ensure you're healthy enough to hike. Hiking is an aerobic activity that gets your heart pumping and muscles moving. It helps reduce your risk of heart disease and heart attacks, stroke, high blood pressure, high cholesterol and some cancers. Hiking -- which burns calories and can help you lose or maintain weight -- targets and strengthens the quads, hamstrings, glutes and calf muscles for a challenging workout. Hiking allows you to explore nature, set aside everyday stresses and demands and stimulates the feel-good chemical hormones of adrenaline and endorphins to boost your mood and energy levels. Further, group hiking allows you to socialize and improve relationships with those around you. If you live at low altitude and take a hiking trip to the mountains, you may experience altitude sickness including lightheadedness, fatigue, mild headache and nausea. Drink plenty of fluids and spend a few days at higher elevations to acclimate to the thinner atmosphere. Weather patterns in the high country can quickly take dramatic shifts. Find out the weather forecast for your hiking destination to avoid inclement weather. Additionally, hiking can be physically demanding and result in muscle soreness for several days afterward. Find out what the difficulty rating is for your hike. If you are not conditioned for the challenge, risk increases for slipping, falling and other injuries. Even experienced climbers and hikers can experience falling accidents, so be cautious as you hike. Whether you plan a day hike or a weeklong excursion, pack for emergencies. Include at least a first-aid kit, sunscreen, rain gear, a map and compass, and a GPS or cell phone. Start your hike early in the morning. Rain and lightning storms often hit the peaks early to mid-afternoon, so time your hike to avoid reaching the top of a tall mountain in inclement weather. Avoid hunger and dehydration by packing plenty of food and water. While this may add additional weight to your pack, you will be grateful for extra sustenance if emergencies arise. Always hike with a companion or a group. Tell friends or family at home where you will explore and give an approximate return time. Before the trip, familiarize yourself with potential wildlife you may encounter and know what to do if you encounter aggressive animals. Depending on the time of year you go hiking, mud slides, slick conditions, muddy trails and high river levels can increase the danger of your hike. In some instances, parks may even be closed if officials determine conditions are unsafe for hikers. Research your trail's conditions before you go. Can You Wear Tennis Shoes to Go Hiking?